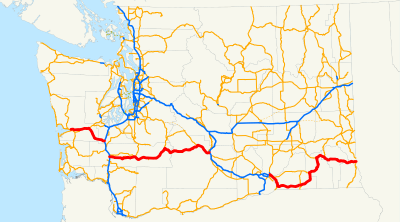 On Saturday and Sunday, August 9-10, 2008, we drove the length of Washington State Route 12 (also known as U.S. 12) all the way from Aberdeen to the Idaho border. 400-some miles, but we did it in less than a tank of gas. Take that, ExxonMobil! And so it begins, in the heart of Aberdeen ("Come as you are. 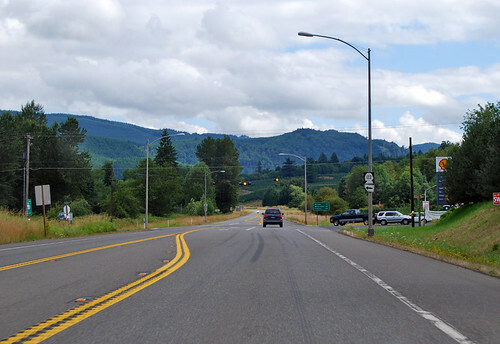 "), US 101 turns right to go over the Chehalis River, and heading straight puts you at mile zero of US 12. Ten miles later, we're back at Montesano, where we had spent the night. We'll be back here in a couple weeks, since SR 107 is the shortcut from Seattle south to Long Beach. 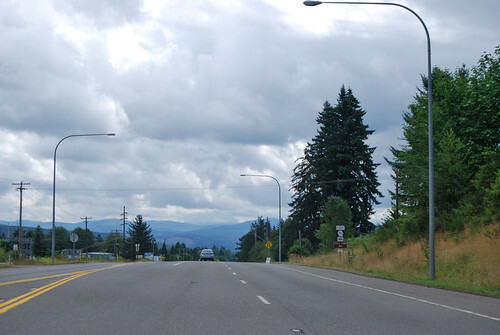 Before too long, we reach the junction with SR 8. This is where you have to exit to stay on US 12. Once upon a time, US 410 went straight here. . .
After a pleasant drive through a section of the state I haven't seen before (Oakville, Rochester, etc. 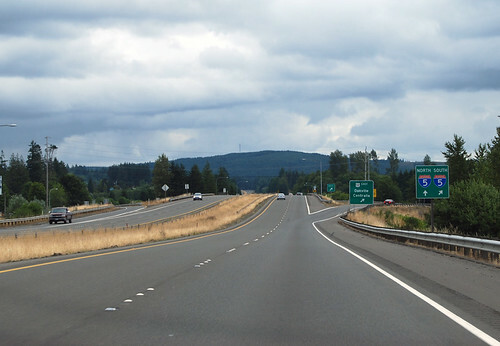 ), we hit I-5, thus beginning the first discontinuation of State Route 12. If you follow the signs, however, US 12 rolls on southward. As did we. 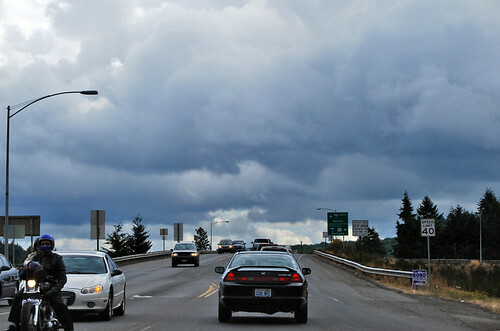 In the vicinity south of Chehalis, State Route 12 starts up anew, leaving I-5 behind. Almost completely unsigned, SR 122 really sneaks up on you. It will take you to Ike Kinswa State Park. It's a good thing I knew these junctions were coming, because the other end of SR 122 was also barely signed. Just a little Washington head with the route number and "JCT" underneath, about a quarter-mile before the turn. We arrived in Morton, at the junction with SR 7, intent on obtaining some chicken gizzards. Unfortunately, there was a parade going on, part of the Morton Loggers Jubilee, and the Chevron's cooks were having a hard time keeping up with chicken strips and jo-jos, much less something weird like gizzards. Alas. Chunlin vowed to never stop there again. 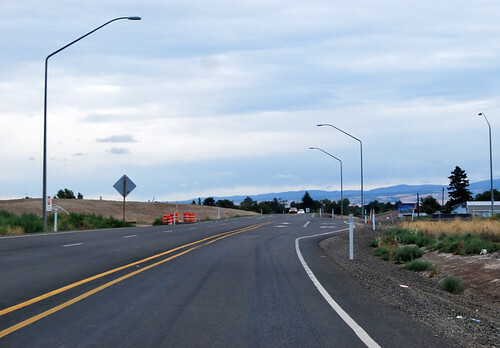 In Randle, a junction with a road to Mt. 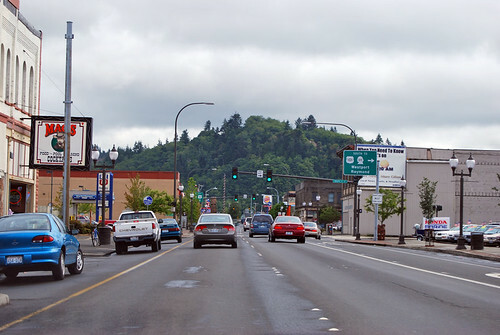 St. Helens, which is briefly SR 131 before turning into a Forest Service road. I woke Chunlin up from a nap and she took this photo three seconds later. I'm married to Quick-Draw Chunlin, I am. 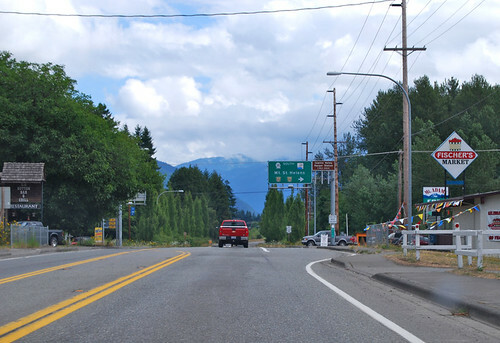 This is the junction with SR 123, high up in the Cascades. Thataway to Paradise and Sunrise. After a mosquito-heavy dayhike at White Pass, we headed down the eastern slope of the Cascades. Douglas Fir quickly give way to Ponderosa Pine, which soon disappear, leaving us with grass and rocks. 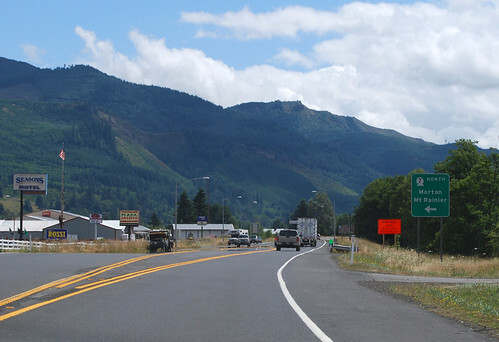 Just upriver from Naches, we reach SR 410, having to take a right turn to stay on US 12. As you can see, going straight wouldn't get us very far. 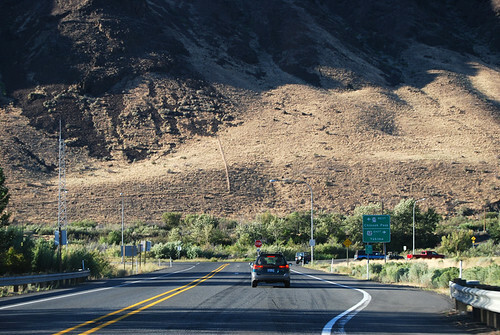 From here to Idaho, our route will follow (more or less) what used to be US 410. 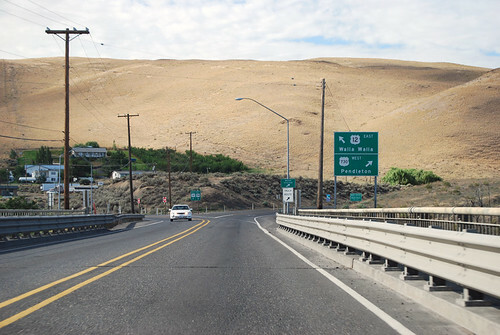 Down at the north end of Yakima, State Route 12 gets absorbed by Interstate 82. 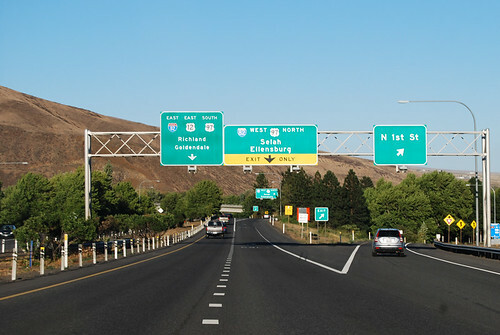 US 12 is cosigned with the interstate (along with US 97 for part) all the way to the Tri-Cities, but there's an hour-long gap in SR 12 per the code, so I didn't bother to get back on at the same exit in Yakima when we stopped for dinner. I'll do 82 in a couple years, don't you fear. The next morning, we hit the road again. 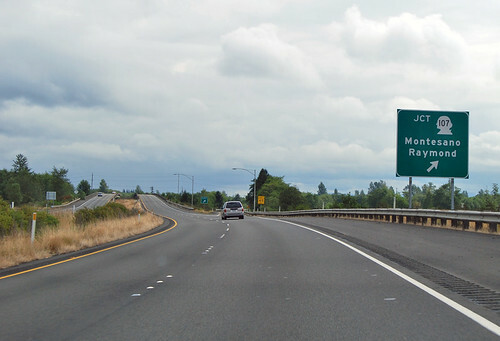 SR 12 starts up again at a "junction" with I-182 near Pasco. 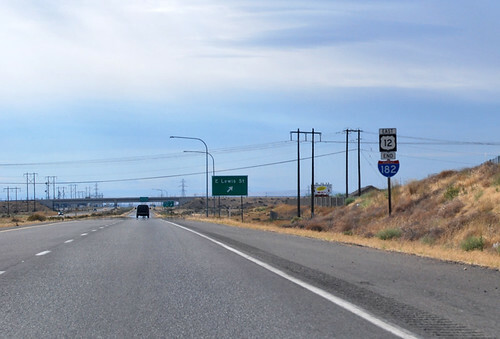 I-182 is supposed to end at a junction with US 395, which should mean that SR 12 starts at that same junction. For some reason, though, the I-182 "end" sign is a half-mile further down the road. Quick-Draw Chunlin proved her skills once again. And thus we're back on 12. 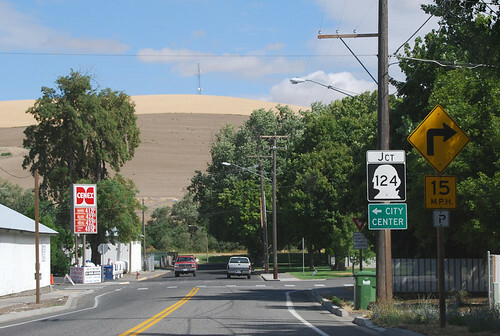 South of Pasco, across the Snake River, we come to the western end of SR 124. 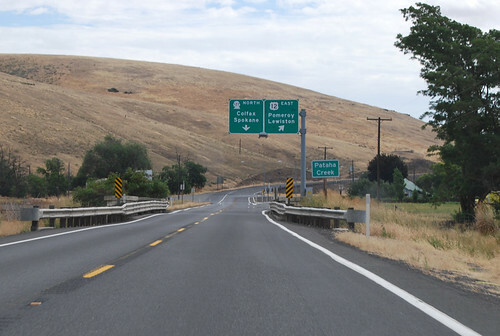 It's a shortcut to Clarkston and Idaho, skipping Walla Walla. 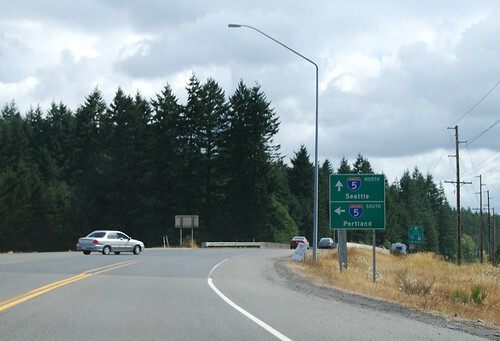 A few miles later, be sure to take a left, or else you'll be taking US 730 into Oregon. And you wouldn't want that, would you? 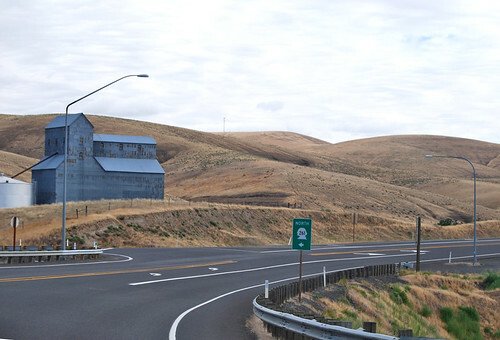 At the edge of Walla Walla, we come to the junction with SR 125. The DOT is rebuilding US 12 from this point back to the SR 124 junction, so this junction was only marked with a temporary orange sign. In a year or two, there'll be offramps and roundabouts and all that fun stuff. Note the pile of dirt on the left, where the new US 12 will be. After turning north to avoid the Blue Mountains (which we never really saw), we arrive in Waitsburg and the eastern end of SR 124. 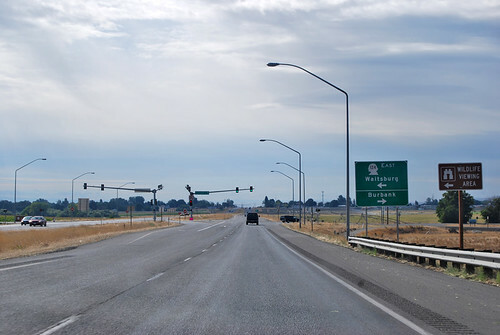 Take a left to head back to the Tri-Cities, take a right to stay on US 12. Go straight if you want to visit the city park. Welcome to the Palouse! 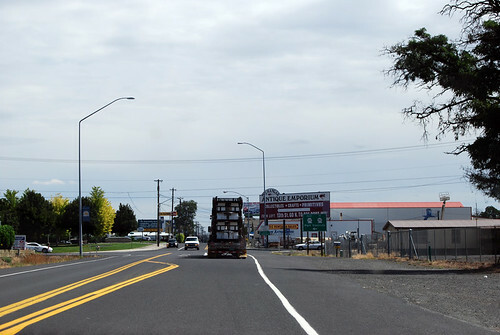 A few miles west on SR 261 is the town of Starbuck. We didn't go check for coffee shops. At the junction with SR 127, there is a public toilet. 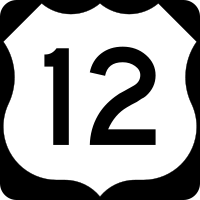 Take a right to stay on US 12. After finally returning to the Snake River, we spy a large bridge in the distance. Lo and behold, that's SR 128 heading northward. Not that you can see the bridge in this photo, but it's there, just out of frame. Trust me. 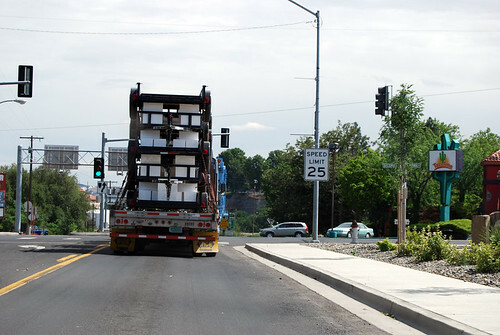 At 6th Street in downtown Clarkston, there's a sign for SR 129 south, but don't let that fool you. It's just a DOT-created spur. The real SR 129 is on Diagonal Street, hitting our route near 2nd Street. In the middle of this blue bridge crossing the Snake River is the border with Idaho. 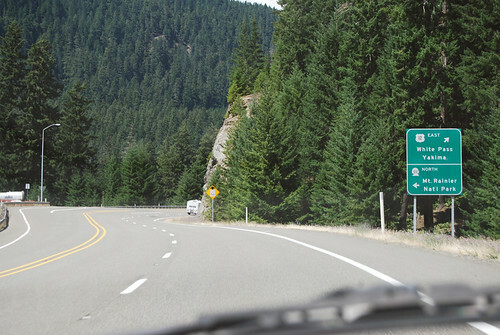 Oddly enough, the "Welcome to Idaho" sign sits firmly on Washington soil. 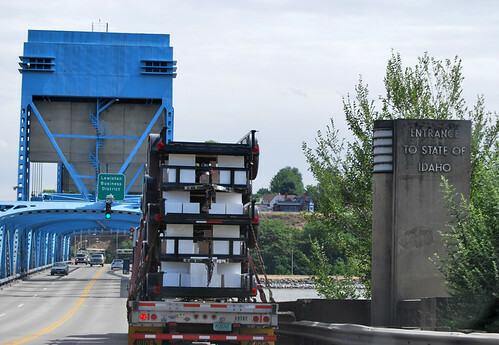 Also strange, the last sign for SR 12 in Washington, on the bridge, uses the Washington head instead of the US-route shield -- the only such signage I spied along the route. And so, after two days and 400+ miles, our drive of Washington State Route 12 is at an end. What have we learned? Well. . . Aberdeen is much wetter than Clarkston. I've scheduled it a few times, but an illness in the family has taken precedence. Next week. We're sure this time.